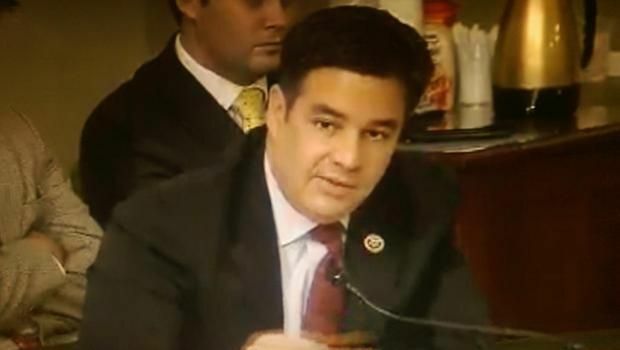 Rep. Raul Labrador questions witnesses at a House Resources subcommittee meeting Tuesday, June 16, 2015. Rep. Mike Simpson testifies for his Boulder-White Clouds wilderness bill June 16. 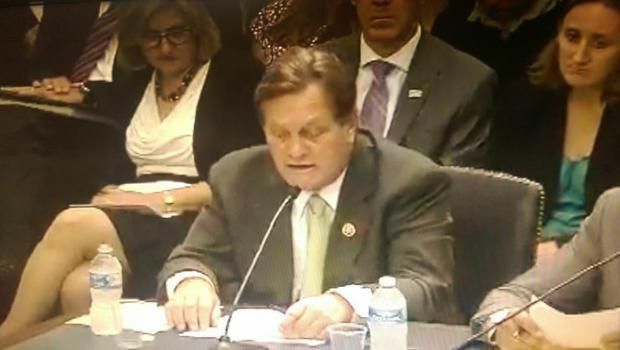 BOISE • Republican Rep. Raul Labrador raised doubts Monday about the support for a wilderness bill Republican Rep. Mike Simpson has pushed for 15 years at a House hearing. The bill would protect 275,665 acres in the Boulder-White Clouds and Jerry Peak area of central Idaho as wilderness. Labrador, questioning a Forest Service official Tuesday at the House Resources Committee’s subcommittee on Public Lands, said motorized recreation users only support the bill because they fear the alternative — a national monument designation by President Barack Obama. “The truth is, the public will is against this bill,” Labrador said. Simpson offered a long list of groups supporting his bill including the Sawtooth Society, the Custer County Commission, East Fork Ranchers, the Idaho Farm Bureau, the Idaho Cattle Association, Idaho Outfitters and Guides, the Idaho Conservation League and the Wilderness Society. He also included the Idaho Recreation Council, whom Labrador argued only support the bill because of the fear of a monument designation under the Antiquities Act of 1906. Neither congressman spoke of the many groups who have expressed preference for the national monument over Simpson’s bill, including many sportsman’s groups, mountain bikers and recreational businesses. Both Labrador and Republican Rep. Tom McClintock, chairman of the subcommittee, asked Forest Service Deputy Chief Leslie Weldon if anything in this bill stops a future administration from using the Antiquities Act to protect the larger area that has been proposed as a national monument. Weldon’s answer was no. Labrador also raised doubts as to the likelihood that the Obama administration would actually create the monument. Weldon and BLM Deputy Director Karen Mouritsen said their agencies had not been involved in any monument mapping or studies. A hearing already has been held in the Senate. The next step is for both the House and Senate committees to mark up the bills and send them to the floor for debate. Once the committees approve them they can be tacked on to another bill. Simpson told the House panel his Boulder-White Clouds bill should not be held up because it would close two trails through the heart of wilderness to mountain bikes. He said the bill opens up two loop trails to mountain bikes and doesn’t close any motorized trails. But the Wilderness Act prohibits mechanized travel through wilderness. The bill would set aside three new wilderness areas totaling 275,665 acres in the Hemingway-Boulders Wilderness (67,998 acres); the White Clouds Wilderness (90,769 acres); and the James A. McClure-Jerry Peak Wilderness (116,898). It also releases from wilderness consideration 153,883 acres of wilderness study area. Another issue raised in the hearing came from the Forest Service’s Weldon, who questioned the location of a transfer of four acres of land from the federal government to the city of Stanley for affordable housing for local workers. “The department would like to identify an alternate parcel that is appropriate for development,” Weldon said. Otherwise she and Mouritsen both offered support for the legislation. Simpson said other parcels of land will be conveyed to Custer and Blaine counties and rural communities for public purposes including cemeteries, water towers and waste transfer sites. Ranchers will be allowed to voluntarily retire grazing allotments in exchange for money provided by a third party. Also, grants have been provided to the Sawtooth National Recreation Area for trail maintenance and improvements, providing primitive wheelchair access to two existing trails, and for acquiring land to build a bike and snowmobile access trail between Redfish Lake and Stanley. WASHINGTON, D.C. • U.S. Rep. Mike Simpson’ Boulder-White Clouds wilderness bill is headed to the full House. BOISE • The House of Representatives Monday voted to approve Rep. Mike Simpson’s Boulder-White Clouds bill without opposition. WASHINGTON • A bill to protect more than 275,000 acres of wilderness in central Idaho is now law. Raul discussing "public will" is an oxymoron.